AND Friday at the church from 10:00 A.M. until 10:45 A.M.
With his family by his side, Robert E. Peterson, age 87, passed away peacefully early Sunday morning, December 31, 2017 at his home. 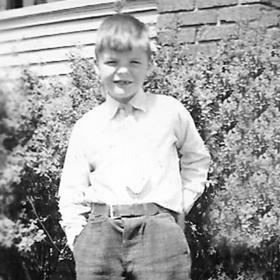 Robert was born in Racine on August 22, 1930, son of the late John and Minnie (nee: Buhler) Peterson. 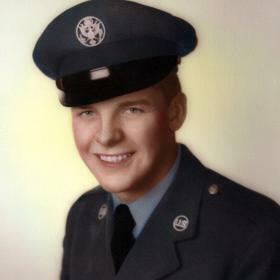 Bob graduated from St. Catherine’s High School “Class of 1948” and from the University of Wisconsin-Madison with a degree in Mechanical Engineering. During the Korean War, he proudly served in the U.S. Air Force as a gunner in the 13th Bomb Squadron, and was discharged as a staff sergeant. 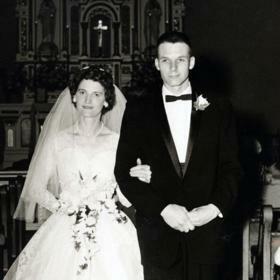 On June 18, 1960, Bob was united in marriage to Agnes Fleuchaus at Holy Name Catholic Church. 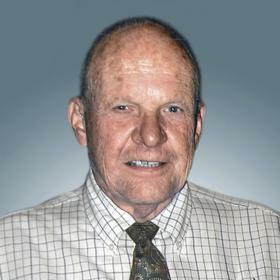 Bob was employed with Racine Federated for over twenty years, before retiring in 1993, and served on the Board of Directors through 2000. He was a charter member of St. Paul the Apostle Catholic Church. In his spare time, Bob loved his time up north at his cabin fishing and his travels around the world with his wife. He also enjoyed gardening, and more than anything cherished his family. 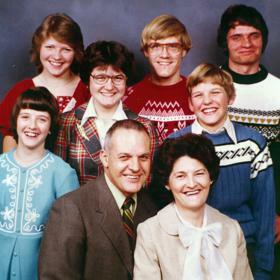 Bob will be dearly missed by his loving wife of fifty seven years, Agnes; children, Paul (Lori) Peterson, Donna (Mark) Siegesmund, Ron (Dawn) Peterson, Joan (Jon) Frickensmith, Greg (Anne-Marie) Peterson, Karen (Joe) Luba; grandchildren, Jake Ostergaard, Anna and Andrew Peterson, Kaitlyn and Sarah Frickensmith, Cherie, Olivia and Tim Peterson, Yash and Grace Luba; brother, William Peterson; sisters-in-law and brothers-in-law, Joyce Peterson, Al (Janet) Fleuchaus, Wally (Paulene) Fleuchaus; nieces, nephews, other relatives and friends. In addition to his parents, Bob was also preceded in death by his brothers, Jack and Don (June) Peterson; brother-in-law, Joe (Pat) Fleuchaus and sister-in-law, Rita (Ed) Braun. A Mass of Christian Burial will be held at St. Paul the Apostle Catholic Church, 6400 Spring St, on Friday January 5, 2018, 11:00 a.m. Interment with Full Military Honors will follow at Holy Cross Cemetery, Hwy 32. Relatives and friends may meet with the family at the funeral home on Thursday evening from 5:00 p.m. until 7:00 p.m. and at the church on Friday from 10:00 a.m. until 10:45 a.m. Memorials to St. Paul the Apostle Catholic Church have been suggested. The family extends a special thank you to Dr. Choi and his staff and to the staff at Hospice Alliance for all of their loving and compassionate care.